KidsEmbrace fulfills their mission of “Making Safety Fun” by working closely with some of the world’s largest brands, including Warner Bros., Disney, and Nickelodeon, to create car seats, strollers, booster seats, baby carriers, high chairs, and more featuring popular characters that kids love. 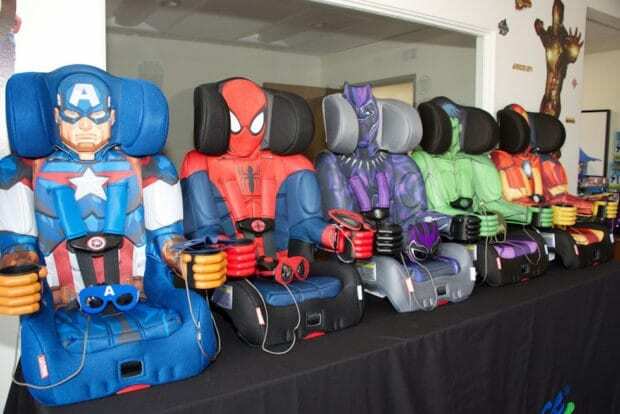 Families can choose from gear that features the likenesses of superheroes, princesses and cartoon characters, and have peace of mind knowing that KidsEmbrace routinely evaluates their products to ensure they are up-to-date with the latest safety regulations and certifications. 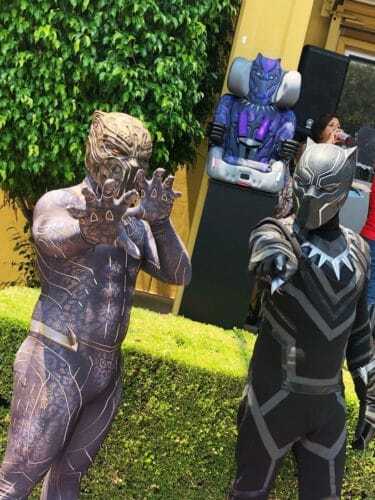 Guests who attended were able to meet Black Panther and Killmonger! The family-friendly festivities at the launch party included character meet-and-greets, face painting, a themed photo booth, sweet treats, and raffles for fun prizes from Bixbee, Goliath Games, Bumkins, Pressman Toy, and more. Guests in attendance included local families, social media influencers, and cast members from Marvel Studios’ “Black Panther” – most notably Denzel Whitaker, who plays James/Young Zuri in the film. At the event, KidsEmbrace revealed the newest car seat to be added to their line: Princess Tiana from Disney’s “The Princess and the Frog,” which was developed as a result of a heartwarming story of Annett Leeks and her 3-year-old daughter, Jada. Leeks won a KidsEmbrace car seat in a giveaway, and was disappointed to see that the company didn’t offer a car seat featuring a character of color. She ordered a Cinderella car seat and, while her daughter was in school, colored Cinderella’s skin and eyes brown and her hair black so the princess looked more like her daughter, Jada. Jada was delighted with the results, so Leeks wrote to KidsEmbrace and expressed a desire for more representation in their future product offerings. Vincent Mastrangelo, COO of KidsEmbrace, was touched by Leeks’ email shared her story with Disney. As a result, KidsEmbrace was given the contract to begin developing a Princess Tiana car seat, which will be released in 2019. To learn more about Kids Embrace car seats and other offerings, visit KidsEmbrace.com. To purchase your own Black Panther or other KidsEmbrace car seat, click here.